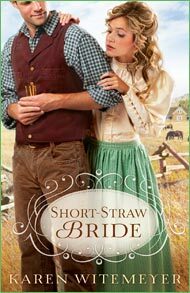 I just finished reading Short-Straw Bride by Karen Witemeyer, may I just say, I was enthralled. Karen wove a beautiful story with such AWESOME (hear me in a sing-song-voice!) romance. Seriously, the romance in this book was tangible and swoon-worthy, and kept me turning the page awaiting for more. But what really struck me was the underlying lesson to be learned through Karen's story. First, let me tell you a bit about the story. Travis Archer and his four brothers were sworn by a dying father to protect their land at all cost. In doing so, the Archer brothers become recluses, never stepping off the land, and striking fear to any and all trespassers. It's when Meredith Hayes comes to deliver a warning that things go awry and she becomes the bride of one of the Archer men. It's a story of budding love and trust in one another. What stood out to me was the whole idea of the Archer men not leaving the land. EVER. They had a friend come to them to barter for supplies and food, but they never stepped off the land. So once Meredith entered the picture, Travis is forced to deal with her wanting to go to town and teach at the freedmen's school. Travis fears for her safety, for he cannot protect her beyond the borders of his land. What's interesting is that he could have gone with her as her body guard, but he doesn't. He doesn't leave the land, because he must protect the land. He ends up trusting her to God as she goes to teach, which is great, but the thing is, he still doesn't trust God enough to step off the land himself. As these men meet more people through Meredith's influence, they step out of their comfort zone and step off the land. They are met with others who come to their aid. They are supported. They didn't have to fear, for they found friendship. And this is a message for us today. So often the busyness of life keeps us in our own little bubble. When we do have free time, all we want to do is hole up and be at home. We want to bury our nose in a book, or a movie, or lose ourselves in the stories we weave, ignoring the world around us. But that is not what God wants from us. Look at Jesus and His ministry. He was with people a lot of the time. He ate with sinners, healed the sick, cast out demons, and cared for the people around Him. Sure, he had time alone, praying by Himself, praying with his disciples, but He spent the majority of his time loving people. We need to be with others. Yes, writers must have time alone to write, but Jesus has a mission in this world and it is to love. To love Him and to love others. We need to connect with others and live life outside of our bubble. It's in this reality that we experience life...life you can write about! Have you been living in a bubble? 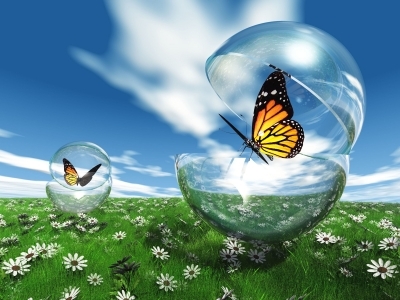 How have you made the effort to get out of your bubble and live life? How will you, if you haven't already? Great thoughts! I read Short-Straw Bride and loved it, but didn't take the time to analyze it like you have here. I really like your analysis. We have to be the light to the world. If we don't, who will? Isn't it amazing how much life can change and grow richer when we learn to trust God and people? Sometimes learning to trust people begins by taking a step to get to know them a little first. I often read books for the fun and then am amazed and pleased when someone like Sherrinda draws me back into the story with great thoughts. I agree. Sherrinda brings out the difficult duty of stepping out of our writer's hermit mode to meet and appreciate the wonderful people around us. That first step...seems so big. Thanks, Lindsay. I think it is something that alot of writers struggle with...getting out of our holes and really living! Mary, it's kinda funny, but I don't always get "lessons" from books. Alot of times they are just great stories...with is AWESOME, but when I hear God speak, well, it just makes the book come alive for me. Sarah!!!! Miss you, sweet girl! I'm so glad you are able to get out and about a bit now. Mom's definitely need some time alone or just to socialize. Come visit as often as you can!! !